Cruise ships dock at the ferry and cruise quay on the Daugava River, it is about 500 meters from the old town of Riga: A 10 minute pleasant walk along the waterfront. The Art Nouveau district is a bit further away. Some cruise companies offer (paid) shuttles to downtown. Totally not needed, in fact the place where the busses are lined up, is about the same distance away in opposite direction as walking to downtown yourself. Old town is a fairly compact area, with many cobbled stoned streets and alleys. There are no buildings or any facilities where you are docked. Check here for festivals and events in Riga when you are in port. Riga is the capital of the Republic of Latvia and the geographical center of the Baltic States. The city's cross-roads location between Western Europe and huge Eastern markets has always been - and still is - one of Riga's attractions for business activities. Riga has several districts. The most popular among travelers is the Old Town (latv. Vecriga, germ. Altriga), German architecture and magnificent Doma Cathedral (germ. Domkirche, latv. Doma baznica) with the world famous organ inside, along with vivid nightlife, makes Riga an most interesting spot. 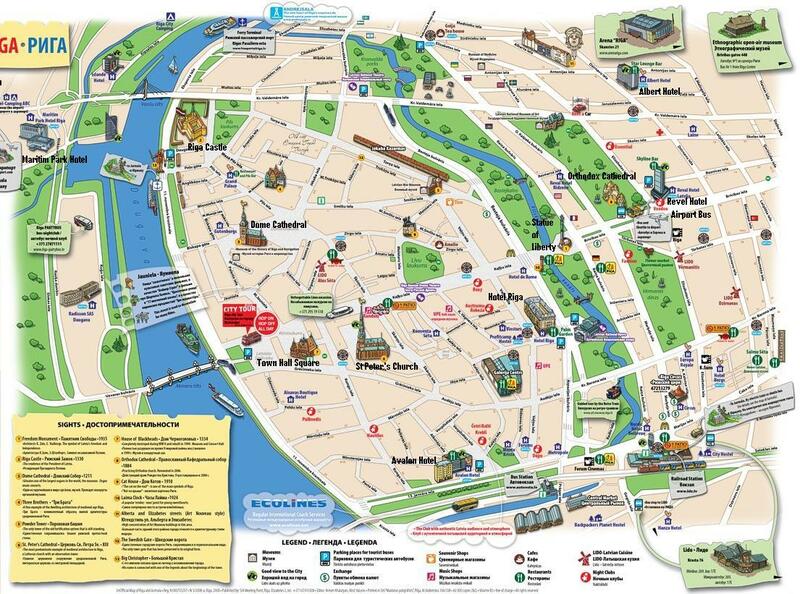 You will need approximately half a day to walk around Riga, and you will not get bored. Riga is a surprisingly lively place with an abundance of sidewalk cafes, shopping areas. The hop-on hop-off service offers a flexible opportunity to get to know historic and present day Riga, although walking the old town is preferred. Several operators run river cruises, taking in local architecture, passing small islands and sometimes venturing out to the Gulf of Riga. Head to the Akmens Bridge and you should be able to catch a boat nearby. Walk towards the Freedom Monument, in the beautiful park just before that, you can board the small covered sightseeing boats, which offer nice views of the city from the canals as well as the Daugava River. 8 Euro/person. If you want to see more of the city of Riga, you can try Eat Riga, this is an alternative walking tour operating daily from Saint Peters church beside Ratslaukums, info on these can be found in the main info center, great way to see more of the places in the city hidden away. The markets next to International Bus Terminal are full of people selling their wares at stalls, both inside the large converted Zeppelin halls and around the outside. The market is actually quite non-touristy with more emphasis on selling things like second-hand clothing, food, furniture or kitchen supplies. In here you can buy almost anything... Very good for souvenirs. There are lots of small cafes scattered around the markets that serve up cheap local eats. Do not miss Alberta Iela (street). The most beautiful street in Riga. Going out for lunch is a surprisingly inexpensive affair in Riga. Riga is famous for its amber products. The Euro is used in Latvia. Latvian (Latviešu valoda) is the official language. Latvian youngsters almost all speak at least some basic English. Many open WiFi spots all around. There is no WiFi where the ship is docked. Specialty shops are open from 8 AM to 6 PM or longer seven days a week. Groceries are open every day till 8 PM or longer. Most supermarkets are open till 11 PM every day.